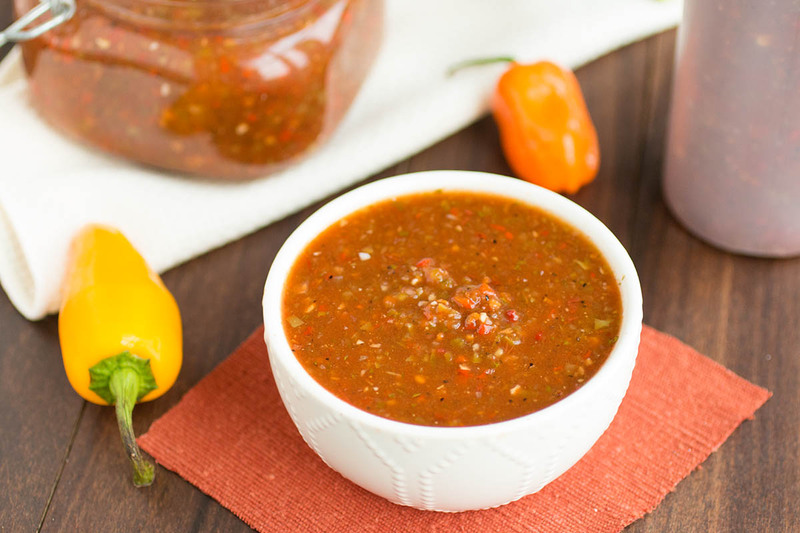 Make your own picante-style sauce at home with this recipe, with fresh tomatoes, spicy jalapenos, tangy apple cider vinegar and more. I use this sauce on practically everything. Can be served as a sauce or a salsa. Dude! I’m excited. Why? Because we have a nice new big batch of PICANTE SAUCE in the fridge. Oh yeah! This is one of my very favorite sauces to keep around. Or is it a salsa? The consistency is somewhere in between and it can be served easily as either a sauce in a bottle that you can douse over anything, or in a bowl with chips that you can serve salsa style. Doesn’t it look gorgeous? So many sauces do. This one has a tongue-grabbing mix of smokiness from the chipotle peppers and tanginess from the apple cider vinegar, not to mention HEAT and FLAVOR from that glorious mix of chili peppers we’ve added in. This is the type of sauce or salsa recipe you can make with any type of chili peppers you’re in the mood for. Looking for a mild version? Go with a couple large red, yellow or orange bell peppers. You’ll still get the smoky-sweet-tang you crave. Want a good mid-range heat level? Go with a mix from jalapenos to serranos or thai peppers. Want some TRUE heat? Consider tossing in a couple habaneros, or a ghost pepper or perhaps a 7 pot. The thing is, you can vary this up to whatever heat level you prefer. I usually like mine on the spicy side. Shocked? Amazed? I know. The sauce recipe is spectacularly easy to put together. I’ve included a VIDEO below that you can review with thequick steps. In a nutshell, to make your own homemade picante sauce, add all of your ingredients to a food processor or blender. Next, process until smooth! Easy enough thus far! Then, pour into a pan and heat through for about 20 minutes to let the flavors mingle. Turn off the heat and cool slightly. 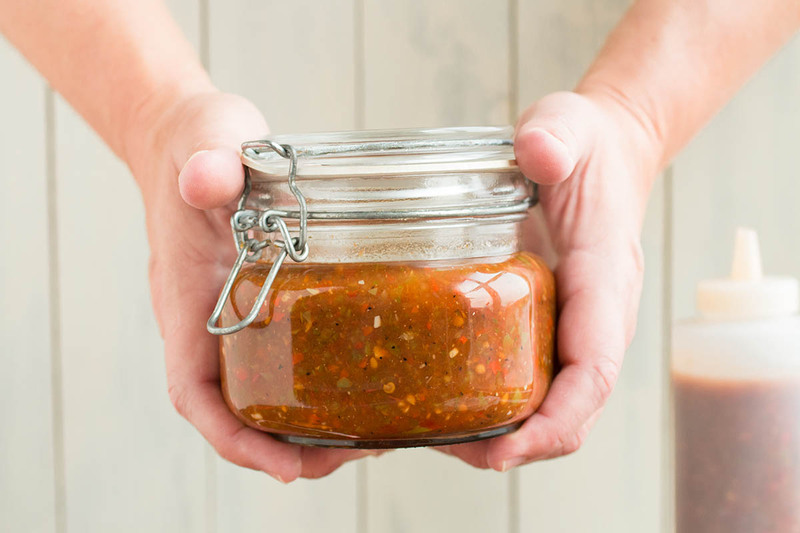 Pour the picante sauce into a sterilized jar or into a serving bottle and you’re good to go. I keep mine in the fridge and spoon it over all sorts of dishes. It should keep a few months easily in the fridge, or even longer. It’s all about the acidity. To be technical, target level ph for shelf stable foods is below 4.6 ph, but should probably be lower for home cooks, around 4.0 or so, to account for errors. I have not measured the ph of this sauce, but I won’t have it around very long anyway. If you’re concerned, add more vinegar to lower the ph. 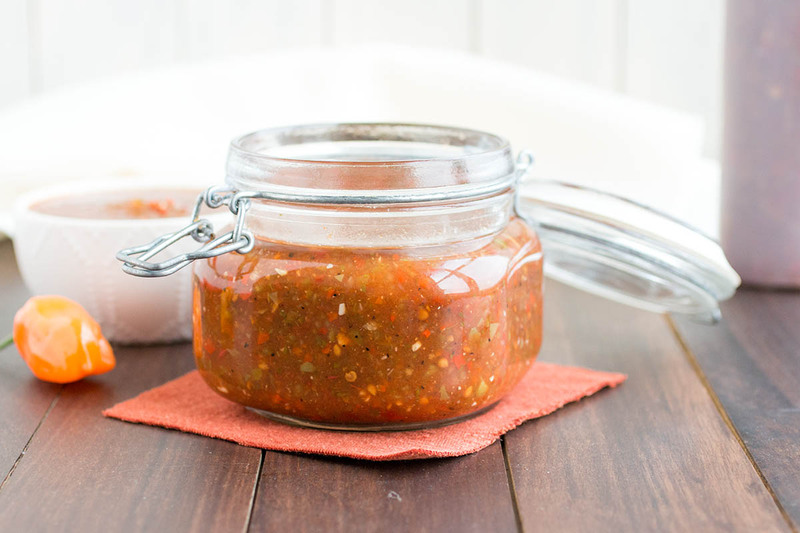 Picante sauce makes for a perfect holiday gift as well, so consider making a large batch and giving them as presents. Your friends and family will love you for it! It is NOT possible to keep enough of this in our house. Plus, all the neighbors keep wanting to steal it. 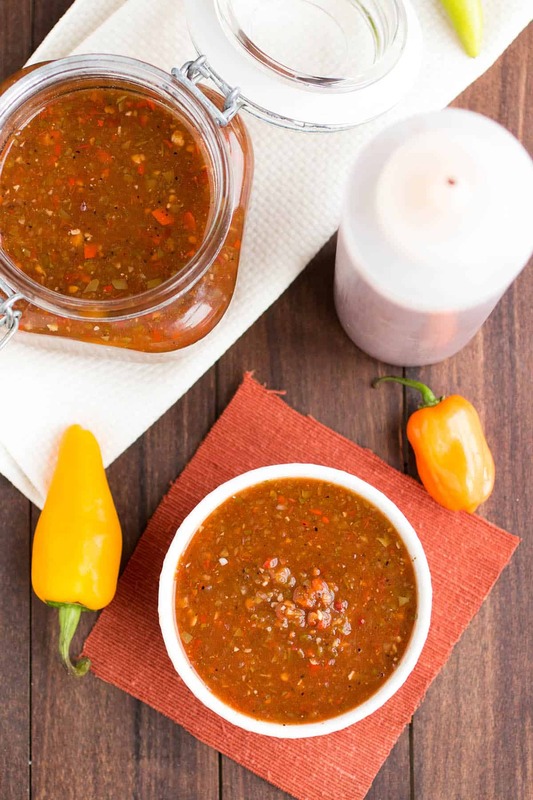 Make your own picante-style sauce or salsa at home with this recipe, with fresh tomatoes, spicy jalapenos, tangy apple cider vinegar and more. I use this sauce on practically everything. Can be served as a sauce or a salsa. Add the chipotle peppers to a small pot and cover them with water. Bring to a quick boil then remove from heat. Allow them to soften about 20 minutes. Remove the stems, chop them and add them to a food processor. To the food processor, add tomatoes, jalapenos, serranos, onion and garlic. Process to roughly chop. Add the sauce to a large pot and bring to a boil. Reduce heat and simmer for 15 minutes. Cool and store in sterilized jars, or use it right away. Heat Factor: Mild, but with BIG flavor. Can you use canned Chipotle peppers instead of the dried peppers? REPLY: Becky, yes, you can, but the flavor will be different from the adobe sauce. I would use a little and adjust to your personal tastes. — Mike from Chili Pepper Madness.